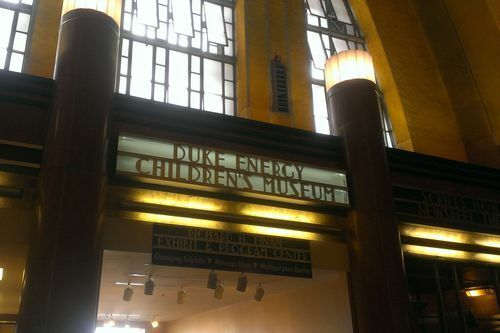 One activity that was on our “to do” list for Cincinnati was taking the kids to the Duke Energy Children’s Museum. 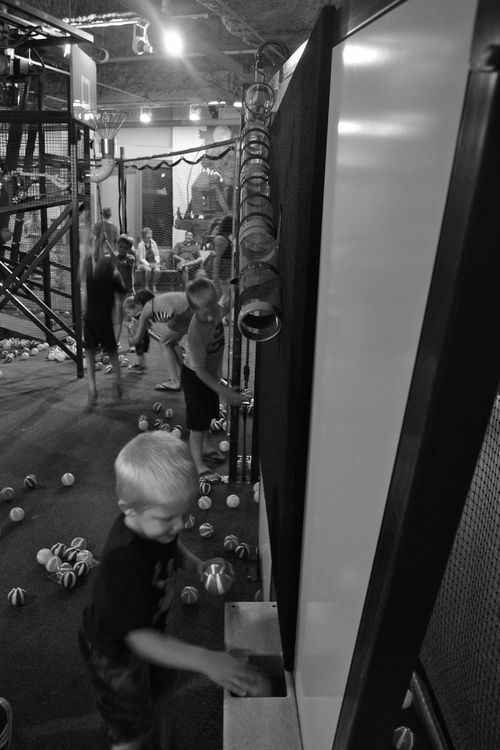 We’ve been to a couple in the past, and they’ve been really fun and interactive and entertaining. 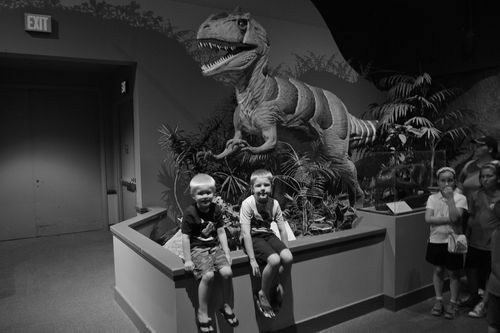 As we were researching for our trip, we found that the Cincinnati Museum Center at Union Terminal (which is where the Children’s Museum, the Museum and Natural Science & History, and the Cincinnati History Museum are all housed) offers free Fridays once a month during designated hours. As fate would have it, the Friday we were planning to be in Cincinnati was one such Friday, and from 4:00-7:00pm we would receive free admission to all three museums. Free is good, so we opted for the later hours and used the beginning of our day to take it easy. We decided to explore a bit in the shopping district near our hotel, and made the Half Price Books store our first stop. 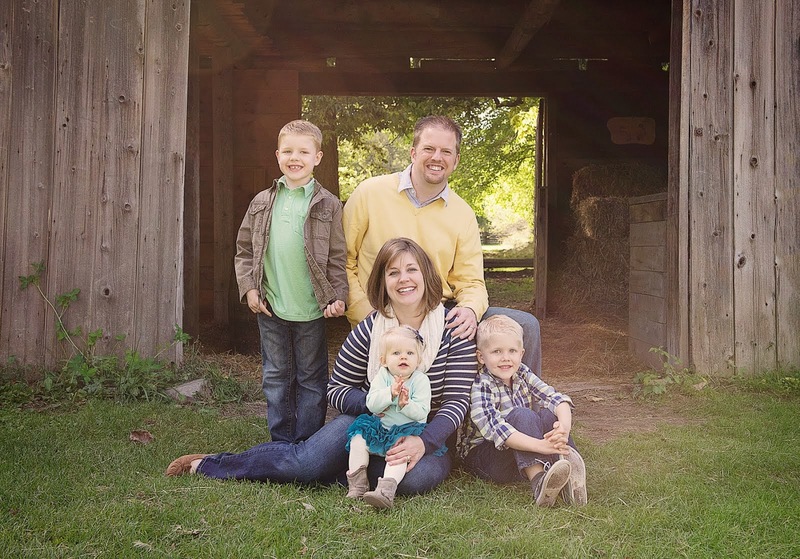 I love that our kids love books, to be read to, and that Drew loves to read himself. They soaked it up. They each picked out three books to buy and we barely got back into the van before they had their noses buried in between the pages. We spent the next couple hours mall walking, clearance rank browsing, and eating at the mall food court. By about 1:30, Brad and I were beginning to wonder what we were going to do for the next few hours until we could make our way to the museums. 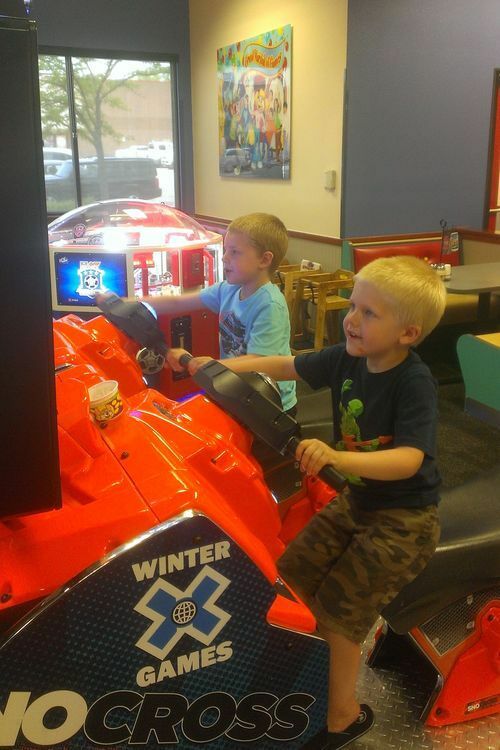 Chuck E. Cheese, to the rescue. 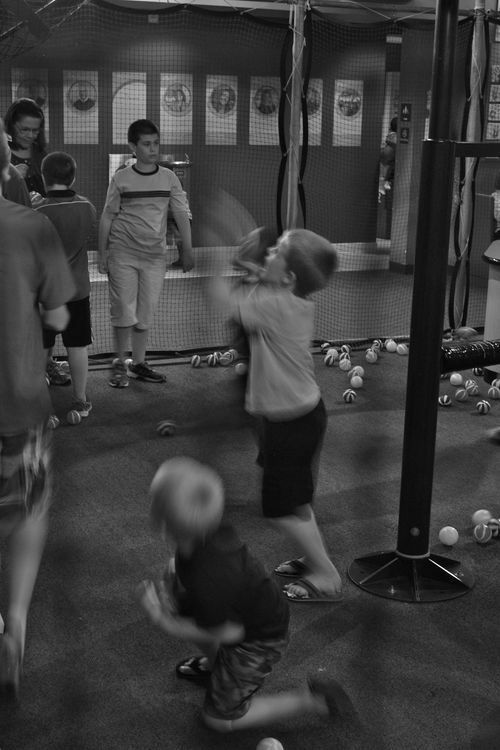 Brad encouraged them to find the games that they enjoyed playing and not to just play for tickets. The prizes are cheap anyway so he wanted to be sure they were playing for have a good time, not just playing to win a mini frisbee or a pencil top eraser at the end. 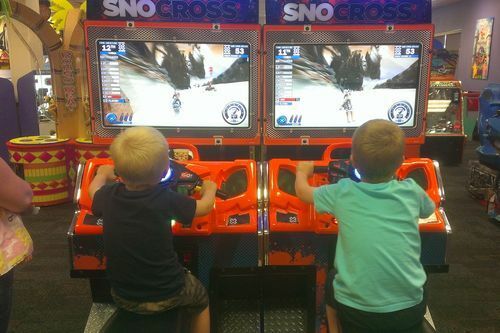 They stuck to this SnoCross racing game for the better part of our time there. And I’ll admit it - it was kinda fun to watch ‘em. The Vander Waal family rating of Chuck E. Cheese: five stars! That’s the boys’ rating. My rating: meh. We made it the Museum Center just before 4:00, got our free tickets and map, and made our way to the lower level to visit the Duke Energy Children’s Museum. 1) When advertised as free, everyone will come. It was super busy. Expected, of course, but sobusy it was hard to really interact and enjoy each display. 2) Of the three or four Children’s Museums we’ve been to, this one wasn’t great. The exhibits were just okay. 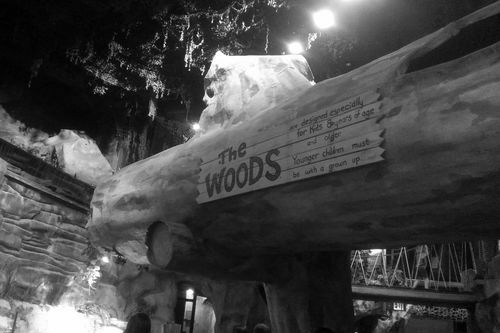 The coolest, and most fun, was The Woods, which was a giant tree house to explore, but everything else wasn’t that fantastic. 3) Super poor picture quality because it was dark in the lower level, and very few pictures because we had a hard time finding space to take many photos. Because it was all free, we also hopped over to the Museum of Natural Science & History and saw a few fun things there - namely, we got to walk through a replica of an actual limestone cave, as well as an ice cave that simulated the last glacier in the Ohio Valley. Both very cool, and probably the highlight of our entire visit. 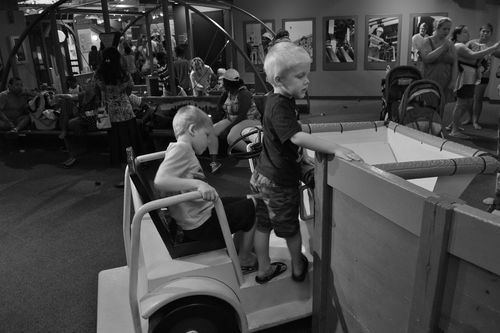 So we cruised through both museums at a decent pace (in part because it was busy and also because it just didn’t seem to capture the boys’ interest and therefore — w.h.i.n.i.n.g). 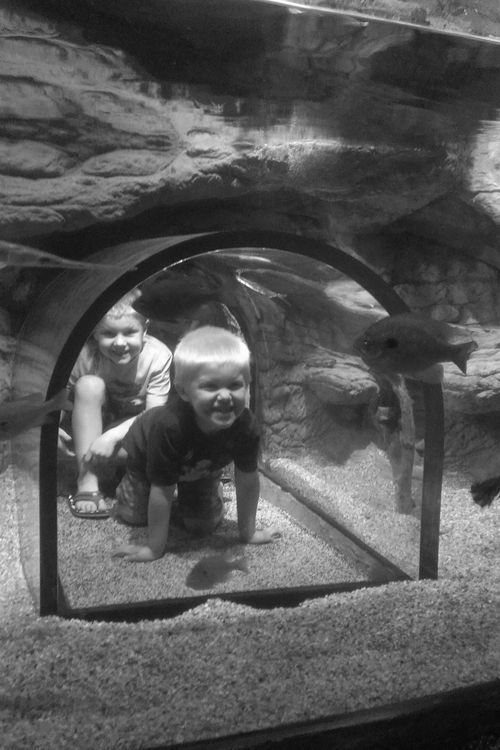 The Vander Waal family rating of the Cincinnati Museum Center: 2.5 stars. Its biggest redeeming value was that it was free; I fear we may have been disappointed with our money spent if we would have paid for admission. But our disappointment also likely lies in the fact that it was so, so busybecause it was free. Win/Lose with that one. There were some cool things to see/do, but like I said, certainly doesn’t rank as high compared to other children’s museums we’ve been to. We scooted out of there and made it to dinner around 7:00 before heading back to the hotel to cash in for the night. 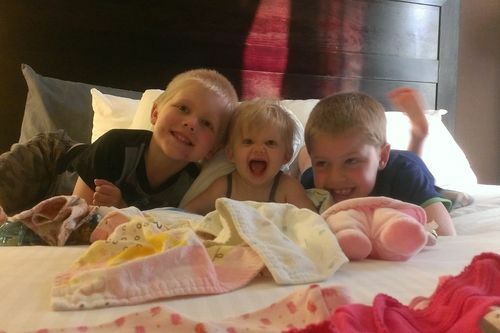 These three. 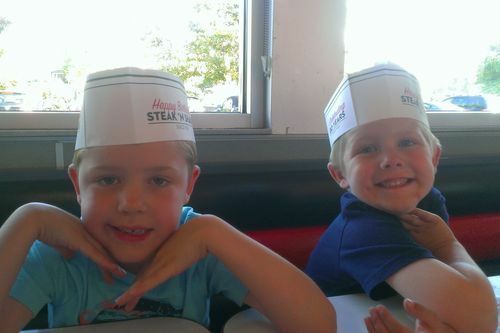 Love the memories - even the whiny ones - we’re making together.